Did negligent security contribute to the nightclub and apartment complex shootings of these local heroes? Read Our Legal Take to find out if the victims may have a claim for compensation. Louisville shooting victims, Johnny Reed and Shenitrea Vaughn, have banned together through tragedy to spread a powerful message to end gun violence. Mr. Reed “was shot outside Legends nightclub on May 1 in Louisville,” according to WHAS 11 News. 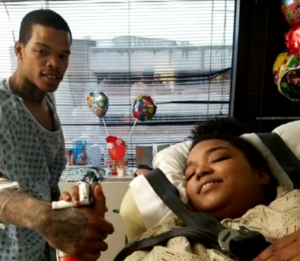 During Mr. Reed’s hospital recovery he formed a bond with fellow patient and shooting victim Shenitrea Vaughn. Ms. Vaughn was shot on April 30th while trying to shield a relative “at an apartment on Catawba Circle in Campbellsville,” WLKY News reports. “Just stop shooting. It’s not a game. It’s life or death and luckily I have life,” said Ms. Vaughn. “I’m about to get out there and school younger people in the right direction–in the direction I’m headed because I’m going to guide their life,” said Mr. Reed. While these brave survivors focus on spreading gun violence awareness to youth and the community, others are presumably questioning what local property owners are doing to protect patrons from such attacks. Apartment residents and nightclub patrons have a right to feel safe and secure within the premises of the establishment they are visiting. The Murray Law Firm questions the level of security provided at the nightclub and apartment complex where these shootings occurred and whether these unconscionable attacks may have been prevented. What nightclub and apartment complex security measures, such as bright lighting, surveillance cameras, and security patrols, were in place to protect residents and patrons at the time of the shootings? Have there been prior incidents of violence on or near either property and, if so, were any additional security precautions implemented by the nightclub and apartment complex owners? Generally, property owners are required to protect all residents and guests legally on the premises from any foreseeable harm. Should the facts of this matter reveal that the owner of the nightclub or apartment complex failed to provide adequate security to protect those on its premises, Mr. Reed and Ms. Vaughn may seek justice and elect to pursue legal claims for their injuries. Based upon its prior successful experience in handling security negligence claims on behalf of victims and their families, The Murray Law Firm suggests that photographs and a thorough, unbiased inspection of the properties will need to be performed immediately, before any evidence may be repaired, damaged or destroyed. Given the complexities of pursuing a negligent security case, it is imperative that the victims retain an experienced attorney who can ensure the preservation of any and all evidence that may support such claims. We’ve Recovered Millions for Victims of Violence and Security Negligence…Contact us Now for a Free Consultation.